The selection of Peter R. Vail as an Honorary Member of the Gulf Coast Section SEPM is a testimony to his pioneering work in sequence stratigraphy and his contributions to both industry and academia during his career of over 40 years. The fundamental impact and influence of his ideas on industry and academia have been very significant, and his earnest desire to teach others both as a professor at Rice University and as a peer is a role to which we can all aspire. Pete's ideas on the unifying paradigm of eustatic cycles are probably as close to an original "breakthrough" concept as most of us are privileged to witness. Pete's worldwide experience with Exxon's research and exploration groups honed the original concept into an immensely practical tool for hydrocarbon exploration, and provided a logical framework in which all geoscientists could build a realistic, predictive stratigraphic framework for their sedimentary rocks, at the seismic or outcrop scale. His lectures, publications, and untiring teaching efforts at Rice have made his methods available to any interpreter or geologist willing to try them. Peter Vail graduated from Dartmouth College in 1952 with an A.B. degree. He attended Northwestern University from 1952 to 1956 where he received his M.S. and Ph.D. degrees. At Northwestern, he was greatly influenced by Professors Larry Sloss and Bill Krumbein, who were at the height of their work on quantified facies mapping and North American unconformity-bounded cratonic sequences. He began his career with Exxon in 1956 as a research geologist with the Carter Oil Company, an Exxon affiliate in Tulsa, Oklahoma. He and his wife, Carolyn, reared a family of three children, who at first grew faster than his reputation. He relocated to Houston in 1965, at Esso Production Research Company, now ExxonMobil Upstream Research Company, and advanced to a Senior Research Scientist, the highest technical position. In 1986, Pete was appointed the W. Maurice Ewing Professor of Oceanography at Rice University. Pete continued working toward the refinement and further understanding of sequence stratigraphic techniques, which are fundamental concepts in common usage by many geoscientists today. Pete took a sabbatical leave in 1992-93 with CNRS in Paris, to lead studies of the sequence stratigraphy of European basins and to revise and document the eustatic cycle chart. He retired from Rice in 2001. Pete's ideas evolved naturally from his first pioneering work on the importance of stratal surfaces in rocks as geologic time lines. He soon recognized the cyclic occurrence of bundles of strata he called sequences in well logs, seismic reflections, and outcrops. When he began seeing that sequence boundaries have the same ages in several basins worldwide, he postulated that global sea level changes are a major control on the stratigraphic record, along with basin tectonics and sediment supply. This realization led to the development of eustatic cycle charts. In 1977, these concepts were published in AAPG Memoir 26. His latest SEPM Special Publication on the sequence stratigraphy of European basins is a tremendous group effort, which led to a major revision of the eustatic cycle chart. In the natural course of his work, Pete has held many important roles in a variety of industry, government, and academic-based steering committees, and has received the recognition of his peers in the form of many honors both from academic institutions and industry-based societies. He served on a number of important committees, including the U.S. Department of Energy Committee on Research Drilling (1987-88), the U.S. Geodynamics Committee of the National Academy of Sciences, and the American Commission on Stratigraphic Nomenclature. He has been honored by professional societies for his outstanding contributions to geology. 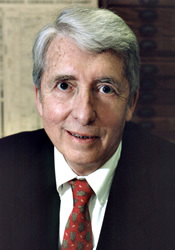 A few of his awards include the Virgil Kauffman Gold Medal in 1976 for the Advancement of the Science of Geophysical Exploration by the Society of Exploration Geophysicists, the American Association of Petroleum Geologists President's Award in 1979, and the AAPG's George C. Matson Memorial Award in 1980. In 1983 he was the recipient of the Offshore Technology Conference Individual Distinguished Achievement Award. More recently, he was awarded the Twenhofel Medal by the SEPM (Society for Sedimentary Geology), and Honorary Memberships in the AAPG and SEG. He has been invited by several universities to serve on advisory committees for their Geology Departments, including Princeton and Northwestern. In addition, he was recognized by universities and societies in France, Belgium, Scotland, England, and Australia with various honorary memberships and awards in recognition of his leading-edge research work. Lists of his other honors fill pages! Pete's extensive publications list, combined with the large number of scientific citations that his papers receive each year, indicate the significance of his work and attest to the fact that he is one of the most internationally recognized experts in the field of sequence stratigraphy. Above all, Pete's greatest characteristics are his integrity, his dedication to his family, and his faithfulness to friends, colleagues and students. It is a great honor to have been part of his life.